No hash tag related to Entourage or it’s fictional movie star, Vinny Chase and no url linking to the show itself. 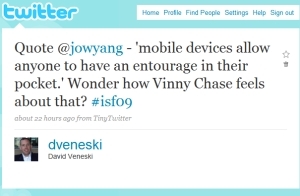 Simply ‘entourage’ and ‘Vinny Chase’ in the string in my tweet. Not 30 seconds later, I get an email in my inbox stating: ‘Ari Gold is now following you on Twitter‘. A follower that’s relevant to MY entourage? Probably not – after looking at the Ari Gold profile and the subsequent website associated with that profile. However, pretty powerful to see an almost immediate reaction to a very innocuous and tongue in cheek Tweet – the power of the social web.